Jutting out on a high promontory overlooking the Bay of Zihuateneyo, La Casa Que Canta boasts some pretty incomparable views of both the city and sunsets over the Pacific. 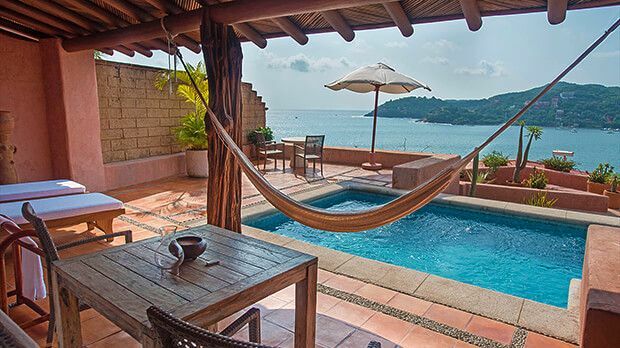 With the blue of the Pacific down below and the ridges of the Sierra Madre del Sur mountains overhead, La Casa Que Canta couldn't ask for a better location with which to tempt visitors to Zihuatanejo. La Casa Que Canta is an ideal venue for weddings and honeymoons - both festive and romantic, the hotel features all kinds of leisure activities as well as family-friendly fun. As long as the sun is out (and it usually is) you won't be able to resist spending time out on the deck by either the freshwater or salt-water pool. The freshwater infinity pool is a special treat, with submerged seats carved out along the far wall - you'll feel as though you're leaning back over the horizon itself. The spa facilities are extensive, offering a wide menu of body scrubs, massages, and rejuvenating facial treatments for both men and women. What better way to end off or (start off) your day than surrendering to pampering, professional hands for an hour or two? Send an availability request with your requested dates to the La Casa Que Canta. Suite with 1 King bed, bathroom with shower and double sinks, air conditioning, complimentary mini-bar, balcony, veranda with two lounge chairs and a view of the ocean. Suite with 1 King bed, walk-in closet, bathroom with double sinks, shower and vanity, outdoor living room, terrace, balcony and a view of the ocean. Each suite is singular in its layout, with distinctive colors, furniture and authentic Mexican decoration. The newly renovated bathrooms are ample, luminous, some with sea views. Oceanfront suite features 1 King bed, ocean view and a plunge pool. Features 1 King bed, living room, covered terrace and plunge pool. Features a King bed, living room, terrace and infinity pool with sea view. Beachfront suite features 1 King bed, plunge pool, terrace and a living room. Beachfront suite features 1 King bed, ocean views and traditional Mexican decor. Located in a private setting, with a garden, 1 King bed, plunge pool and traditional Mexican decor. Oceanfront suite with 1 King bed, walk-in closet, bathroom with double sinks, shower and vanity, outdoor living room, private infinity pool, terrace, balcony and a view of the ocean. 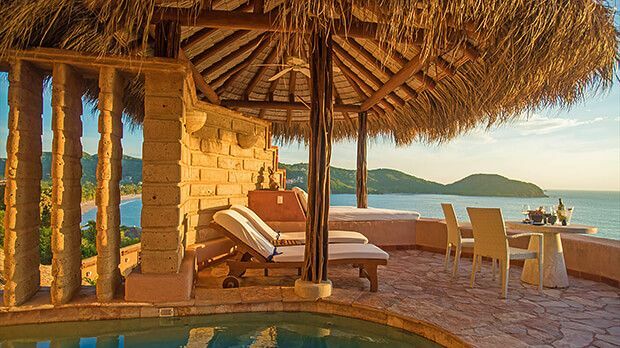 Oceanfront penthouse suite features 1 King bed, 180 degree view, ocean view, plunge pool and traditional Mexican decor. This penthouse has an elegant décor with hand-picked crafts chosen by our founders. The stunning 180° ocean view from the large living terrace and plunge pool are unique. The owner’s suite includes all commodities to make your stay a memorable experience. Suite with 1 King bed, authentic Mexican art, bathroom with double sinks and shower, living room, air conditioning, private veranda, patio, lounge chairs, hammock and a view of the ocean. Beachfront suite features 1 King bed, living area, garden and a plunge pool.